As promised I am back with some gold and silver sparkle to share. I used Gina K. Designs Foil-Mates™ and Fancy Foils to make my background. You can find all of her Therm O Web products right here. Foiling is so quick and easy and it really packs a sparkly punch! I used stamps and dies from the Fabulous Holiday Labels for my silver strip and oval. I heat embossed the images with Gina K. Designs Fine Detail Embossing Powder in silver. My focal image and sentiment are from the Peaceful Holidays stamp set. 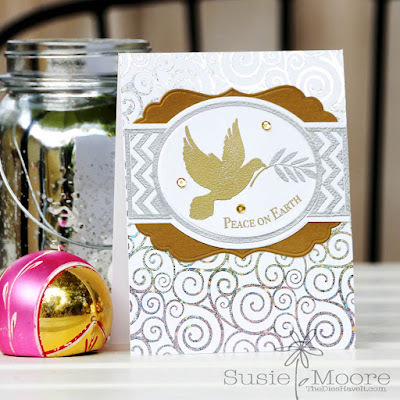 I used both the gold and silver embossing powders to give them their own sparkle. I love using multiple embossing powders on cards. It makes people wonder how I made the card! I'll be back tomorrow to share a whimsical Christmas card. I hope I'll see you then. I adore the look of gold and silver together. It's absolutely gorgeous! Thanks for sharing!! !